Materials needed: Green commercial or Homemade (omit the peppermint in the recipe and substitute green food coloring for the red) Play Dough and one Earth Day Play Dough Mat (linked above) for each child. Print the play dough mat for the children and laminate or cover with clear contact paper. Have the children cut the circles out. 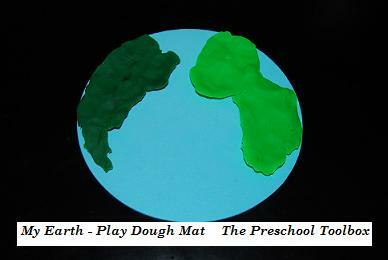 Let the children form the Earth’s “land” using the green play dough. When laminated, the mats can be wiped cleaned and reused during your Earth Week activities! Materials needed: Red, Orange, Yellow, Black, Blue, and Green Wikki Stix© and a sharp knife (ADULT ONLY). 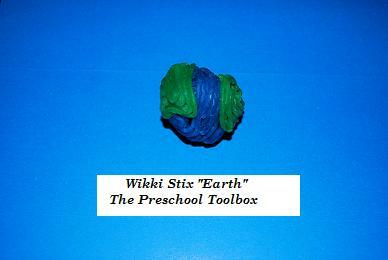 In order to help our children understand that the Earth has layers, make a Wikki Stix© Earth to present to the children. Roll a small red ball from the Wikki Stix© and then cover the ball with the different colors of Wikki Stix© until the Earth is formed. RED=Earth’s inner core; ORANGE=Earth’s outer core; YELLOW=Earth’s mantle; BLACK=Earth’s crust; BLUE=Earth’s water; and GREEN=Earth’s land. The “layered” Earth is an ADULT only craft. Once the Earth is formed, carefully slice the ball (you will need a sharp knife) and pry apart to display all of the layers. The kids will be amazed at what’s inside! Most of the children will ask where the “LAVA” is!! The Earth can be opened and shut for repetition of the lesson, if desired. 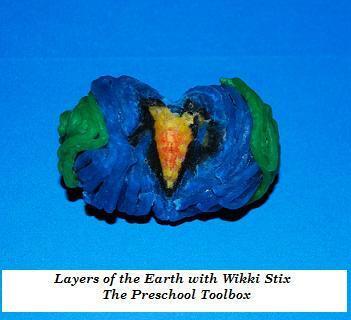 For the CHILDREN, have them make a blue ball from the Wikki Stix© and use green Wikki Stix© to make the Earth’s land formations on the outside of the ball. Materials needed: Liquid glue, unscented shaving cream, blue/green food coloring or paint, paper plates, and plastic spoons (for spreading). Stir the mixtures well. Have the children use the spoons to transfer the blue puffy paint (to resemble the Earth’s water) to their paper plates and spread into a circle. 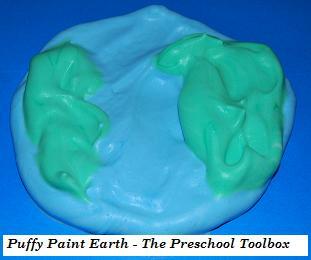 The children can then add the green puffy paint on top of the blue to make the Earth’s land. Allow the Earth crafts to dry thoroughly before sending home (if doing in the classroom). We placed another paper paper (upside down) on top and enclosed the craft in large plastic bags to help the children transport them home! For CONSERVATION activities, see here! Do you need additional lessons and crafts for your children this Spring? The Spring Weather Theme is designed for children ages 3-6 and is now available on this blog! « Non-Standard Painting Tools and Crafts for Preschool: Legos, Blocks, and More!